Mr. Speaker, I’m the second youngest Member of the 18th Legislative Assembly, but that’s not saying much. In fact, my days of being considered a youth are long gone. However, Mr. Speaker, I was elected to represent all of the constituents of Hay River North, not just those who can vote, so, while I may be old, I can’t afford to be out of touch. That’s why this past Monday, over the lunch hour, I held a constituency meeting at Diamond Jenness Secondary School that was exclusively for students. Fourteen students attended, mostly from grades 8 to 10. I was a little worried that maybe they were only there for the free pizza, but, Mr. Speaker, my fears were unfounded – they were definitely there to talk about the issues. I spoke for a couple minutes about how our system of government works, and then opened up the floor, and for the rest of the hour I listened to their concerns and answered questions. Unsurprisingly, a lot of the issues revolved around education. I heard first-hand about how they were directly affected, in terms of workload and ability to succeed, by changes to the curriculum. They were concerned about the lack of course selection, especially compared to other jurisdictions. Some felt that they could have trouble following the career path they want, because they didn’t have access to the right courses. They wanted more practical education as well, with courses that teach them about the real world – things like taxes, and budgets. There was concerns about the lack of special needs helpers in the school, and the need to rely on third party funders and other students to provide special needs support. Then, Mr. Speaker, there’s busing, or, more precisely, the lack of busing. Bus routes have been cut back so much that there’s only a handful of students at Diamond Jenness who are even eligible to take the bus. Lately, they’ve been hearing rumours that busing in Hay River may be eliminated completely, and are rightfully concerned. The discussion also extended beyond education, and went places I didn’t expect. There were concerns about how we’re providing for our elders, and what the government is doing to ensure that age appropriate housing is available. They were also concerned about the lack of skilled workers available to construct that housing, and to complete other projects in the community. These are just a few of the topics that we touched on. It was a very enlightening discussion, and we all agreed that we should do it again, and I plan on it. I’ve also reached out to École Boréale and hope to meet with students there in the near future. I promised the students that I’d get back to the students with answers to their questions, and I’ll start today with questions for the Minister of Education. MR. SIMPSON: Thank you, Mr. Speaker. Mr. Speaker, earlier, I spoke about the constituency meeting I held at Diamond Jenness Secondary School in Hay River. I had a great discussion. I told the students that I would bring their questions forward and get some answers for them. I have some questions for one of the other youngsters here in the Ledge, our Minister of Education. I would like to ask the Minister: students at Diamond Jenness are concerned about the lack of courses available to them. They brought up a lack of dash-4 classes, basic courses like core French, and courses that better prepare them for real life. I would like to ask the Minister of Education why the students at DJ have less access to courses than other places such as down south and even Yellowknife? Thank you, Mr. Speaker. MR. SPEAKER: Masi. Minister of Education, Culture and Employment. HON. ALFRED MOSES: Thank you, Mr. Speaker. Mr. Speaker, the Department of Education, Culture and Employment does not decide what courses are being offered each semester within their respective schools. That is the responsibility of the school administration in consultation with the superintendents of education. DJSS could offer dash-4 courses, dash-1 courses, but it is the responsibility of the school administration and the superintendent. I think that needs to be brought up to the superintendent as well as brought forth to the administration of the school. MR. SIMPSON: The buck has to stop somewhere. As far as I am concerned, it stops here, in the Legislative Assembly, with the Members of the Legislative Assembly and the Ministers of the respective departments. That’s why I want to ask the Minister of Education: other than talking to the Education Council, what can be done to expand the course selection at Hay River and other schools across the territory? HON. ALFRED MOSES: As I mentioned, each school obviously decides what courses they want to offer. Each school is different from the next. Courses that are being offered in the Sahtu might be different from what’s being offered in South Slave compared to some of our coastal communities. That’s why one of our programs, the Northern Distance Learning Program is so important and such a great investment that we’re able to offer some of these dash one courses to our rural and remote communities, and that’s an initiative that this government is proud of, and will continue to support, but it really is a school administration decision, and working with the superintendent to decide what courses that they want to offer. As a government, we’ve committed to making sure that students in our rural or remote communities such as Ulukhaktok, Fort Liard, Fort Resolution, can offer dash one courses because it’s been an initiative that we’ve supported and taken on, but it really is up to the school administration and the superintendent. I encourage the Member to have those discussions with the school to bring those concerns forward, and we will support it, obviously, moving forward as well. MR. SIMPSON: I see that there’s one innovative solution that the government is undertaking to expand course selection, so that’s what I’m looking for – more innovative solutions like that. Maybe facilitate, so the different school boards can work together to pool their resources so they have the critical mass that they need in order to offer more of these courses. I’m looking for more solutions. My next question is that students are concerned about the lack of support for students with special needs. I believe the Hay River Métis Government Council puts in people in the schools, and I know that other students help students with special needs. Why do we have to rely on these methods? What is being done to remedy the lack of special needs support in the schools? HON. 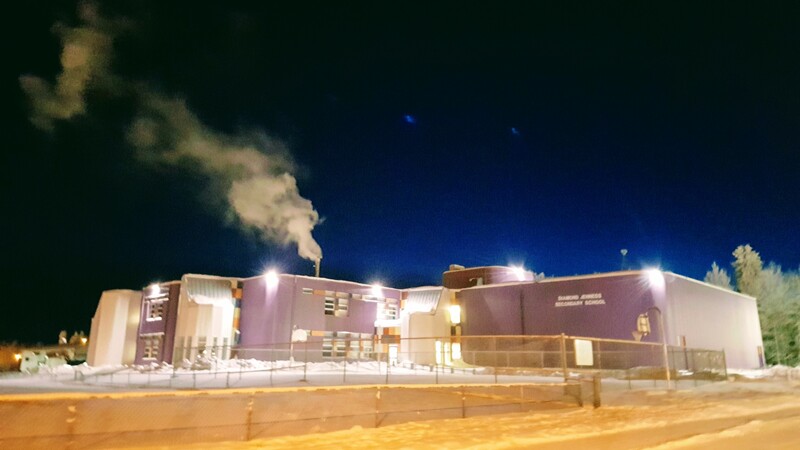 ALFRED MOSES: It’s great to see that DJSS has great working relationships with the Hay River Métis Government Council. We also see that up in my region, where the IRC has taken one of the leading roles to help their students succeed, as well. As a government, we do provide inclusive schooling funding to all, well above the legislated amounts that we have, and work with our education authorities, our superintendents, board chairs, to ensure that services are being provided to assist those with special needs in the communities. MR. SIMPSON: Thank you, Mr. Speaker. It sounds like there are a lot of people involved in this. We have Aboriginal groups. We have Education Councils. We have District Education Authorities. We have ECE. It seems like there must be a simpler way, but I guess that’s the way it is right now. Most students in Hay River can’t take the bus to school because they live too close. Basically, if you live anywhere between the bridge and the “Welcome Hay River” sign, you can’t take the bus, so there are only a handful of students in DJ who actually take the bus, and now, they hear that bus service may end completely. What is the department doing to prevent this so we can make sure that kids actually get to school so they can learn? Thank you, Mr. Speaker. HON. ALFRED MOSES: Currently, work has begun to determine the current status, the gaps in services, and how to best address these gaps when it comes to busing. A steering committee has been formed which includes representation from the NWT Superintendents Association, the Department of ECE, and the Financial Management Board to make recommendations on opportunities for potential improvements in providing student transportation for services from junior kindergarten to grade 12. We’re going to work on gathering that data, and look at the recommendations, and once the analysis of the status is complete, we will share those recommendations with standing committee and get feedback, as well. Thank you, Mr. Speaker. Next Entry:Congratulations to Brendan Green!